Ovarian Psycos Present: A Toda Madre May Luna Ride! TOMORROW! – O.V.A.S. Ovarian Psycos Present: A Toda Madre May Luna Ride! TOMORROW! Join the Ovarian Psycos for our monthly Luna Ride on Wednesday May 14! This ride is dedicated to Dia De Las Madres for all the mamasitas, abuelitas, nanas, tias, primas, hermanas..We will be ending at Corazon Del Pueblo for their monthly open mic Flowers of Fire! *PLEASE NOTE: This ride is for womyn, womyn identified, queer, trans, gender non conforming individuals. 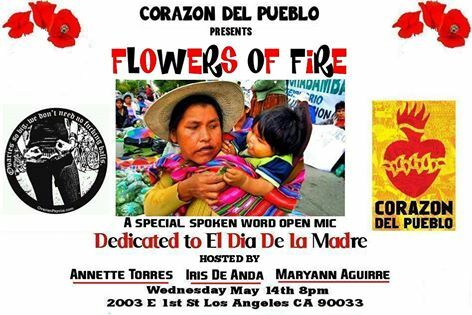 Ending at Corazon Del Pueblo for the open mic of Flowers of Fire dedicated to El Dia De Las Madres. Come share your stories of motherhood with the community. Hosted by Annette, Iris, and Maryann of the Ovarian Psycos! This ride is gonna be a toda MADRE dont miss it! Previous PostPrevious Ovarian Psycos merch on ETSY!!!!!! !